Last week the College Hill Community Urban Redevelopment Corporation announced that an agreement had finally been reached between the City of Cincinnati and the Saint Francis Group to develop a collection of properties at the intersection of Hamilton Avenue and North Bend Road. The 7.5-acre site is actually a collection of three properties that the City of Cincinnati acquired over recent years. Perhaps most prominent is the 5.2 acres of land at the northwest corner of the intersection where a Kroger and Eastern Star once operated. While the Eastern Star site was cleared in 2012, it was not until 2014 when the Kroger site was cleared and readied for new development. The third piece of land that makes of the rest of this site is actually across the street at the northeast corner of the intersection. This 2.3-acre site has also been cleared and is largely ready for development. The announcement of the preferred developer agreement comes more than a year-and-a-half after City Hall approved the community’s form-based code, which the Saint Francis Group has committed to work with as part of their planned development. “CHCURC has worked with the City of Cincinnati for a decade in the acquisition of these parcels, which are key in the continued revitalization of College Hill,” said the president of non-profit development corporation, Michael Cappel. While the original designs for the redevelopment of these sites were conceptual in nature, it is the hope of many in the community that Saint Francis Group continues down that path. 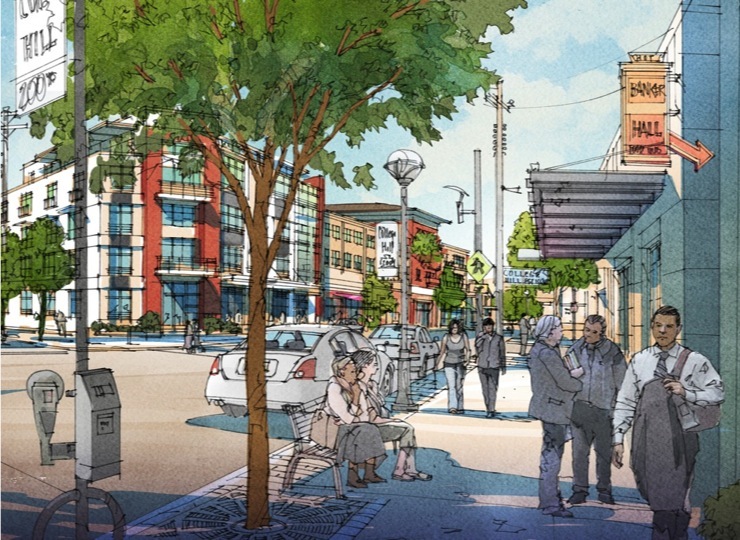 “The vision for the redevelopment of the former Kroger’s, Shuller’s Wigwam, and the Eastern Star Retirement Community includes a mixed-used development, with retail, residential, and offices uses, that will bring increased density and vitality to this walkable, urban village,” Cappel explained. Should such a vision be realized at this location, it would serve as a major boost for the northern end of the neighborhood business district, and would inject notable amount of residents into the area. While Saint Francis Group has a fairly extensive track record of real estate consultancy and development, its ability to execute a project of this nature will be tested. Fortunately, they have hired Jeff Raser from Glaserworks, and a key architect of Cincinnati’s form-based codes, as their lead architect for the project. Project officials say that architectural drawings are being put together now, in conjunction with neighborhood leaders, and they hope to announce a project name, cost estimates and a project schedule within the next four to eight months.